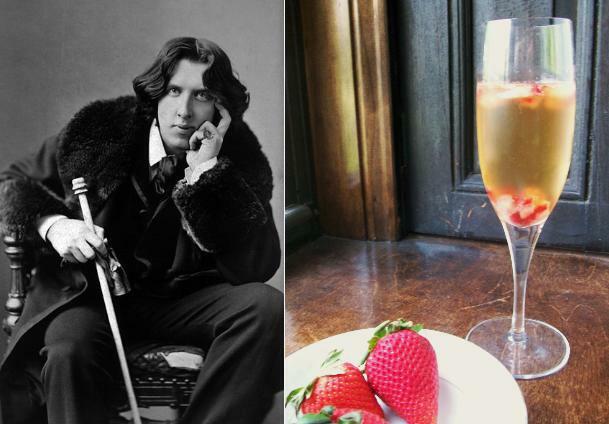 In John Betjeman’s poem “The Arrest of Oscar Wilde at the Cadogan Hotel,” Wilde was drinking a hock and seltzer when the police came for him. A throwback made with white wine and soda, it’s a drink that the hotel still serves today. But it also serves a variation of this champagne cocktail, in honor of Queen Victoria. And to me, any cocktail made with Wilde in mind has to have some of his signature fizz. If you’re sipping Perrier-Jouët or Dom Pérignon, adding anything else seems extraneous – why mess with a good thing? But adding a splash of cognac and a bit of sweetness turns regular Champagne days (and since this is Wilde, we’re talking every day) into special occasions. Plus, the strawberries in this cocktail add an extra Wildean touch: the right color. According to the Cadogan, Wilde liked his Champagne pink. 1. In a small bowl, combine diced strawberries and sugar. Let sit 1/2 hour, then muddle with a muddler or a wooden spoon (the back of a fork works in a pinch). 2. 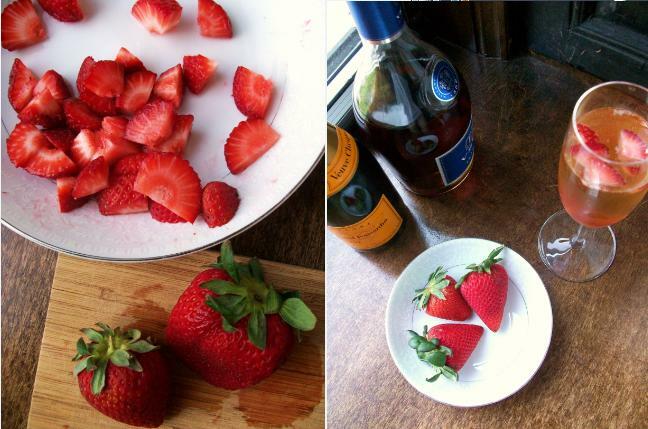 Add cognac to the muddled strawberries, then pour the mixture into two Champagne flutes. Top with champagne and garnish glass with an extra strawberry, if desired. Toast yourself for a job well done. Oscar Wilde is definitely one of my all-time heroes. I certainly can’t imagine him preparing anything more strenuous than some muddled strawberries with champagne. Of course, as you’ve said, he didn’t even go that far, but would instead have someone else do the prep and serve it to him. Now, where’s my valet? In terms of wit, no one beats Wilde – he’s definitely what I aspire to on that front! Case in point – his other legendary (although probably apocryphal) last words were, “Either these drapes go, or I do.” I’ll spend my whole life trying to think of something that good! Thank you, Amy. Your projects are always so fun to see as they develop – I can only knit, but now I need to learn more! Oh, thank you so much for thinking of me! I need to get on this this weekend – in the meantime, I’ll be thinking of all the fantastic bloggers that deserve a shout-out (too many to name, but what can you do?). If I were to make a whole punch bowl based on this, how much of everything do you think I would need?